The mission to understand matter and the forces of nature continue to drive ever larger and more complex experiments in the scientific field of physics. Major efforts are being undertaken to explore the cosmos, determine the properties of matter and harness the forces that flow within our universe. In order to do this scientists and engineers are constructing machines and instruments that are larger, more powerful and more sensitive than ever before. For example, astronomers are using an ever expanding part of the electromagnetic spectrum to detect a host of previously unknown phenomena and look further into space. Radio telescopes reveal the remnants of exploding stars while even higher energy instruments, like those using X-rays and gamma rays, make it possible to study the behavior of matter in extreme states, such as those found in pulsars and blazars. Instruments with increasing sensitivity are now being constructed to push the limits of observation. Arrays of telescopes are being connected together over vast areas and distances. In other research particle physicists are using large machines that accelerate particles to ever higher energy levels in order to observe what happens when they collide. High-energy accelerator science has helped to identify the building blocks that make up matter and increased our knowledge of sub-atomic structure. Similarly, nuclear scientists are studying nuclear reactions in order to understand processes like thermonuclear fusion that offers potential access to enormous amounts of energy. All of these types of big physics experiments involve the use of large numbers of sensors (detectors, antennas, transducers, receivers, etc.) and associated fast electronics in order operate the machines and to capture the crucial data they produce. For physics applications Spectrum offers a variety of high-speed digitizers with a wide range of bandwidths, sampling rates, and dynamic range so that they can best match the requirements of each application. When large dynamic range and maximum sensitivity is needed high-resolution 14 and 16 bit digitizers are available for the capture and analysis of signals that go as high as 250 MHz in frequency. These high-resolution cards deliver outstanding signal-to-noise ratio's (up to 72 dB) and spurious free dynamic range (of up to 90 dB) so that low level signals can be detected and analyzed. For even higher frequencies 8 bit digitizers are available that offer up to 5 GS/s sampling rates and 1.5 GHz bandwidth making them ideal for capturing nanosecond and sub-nanosecond pulses and pulse streams. The digitizer cards can also be used with down-converters to further extended their operational frequency far into the microwave range. Each digitizer card can have from one to four channels and up to eight cards can be linked together with Spectrum's StarHub system to create instruments with up to 32 fully synchronous channels. Systems with even more channels can be created by connecting together multiple instruments. This makes them ideally suited to applications where multiple sensors, receivers or detectors are used. With large on-board memories (up to 4 Gsamples/card) and advanced streaming and readout modes the digitizers are perfect for capturing long and complex signals. Streaming data over the cards fast PCIe bus to a RAID based storage array can even allow the capture and storage of hours of information. 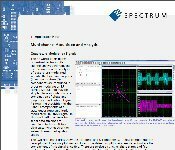 Spectrum's S Bench 6 software can also be used to view and qualify signals as well as perform FFT calculations for frequency domain analysis. Typical applications in big physics include radio astronomy, accelerator science (including beam control and beam line monitoring) and particle physics, fusion and plasma research (Tokamak), nuclear science and lightening studies. in the machine protection systems of the Large Hadron Collider (LHC) at CERN. The cards are used to check that the particle beams have been accurately deflected. Incredible precision is required for this as two high-energy particle beams travel at close to the speed of light in opposite directions in the 27 km LHC accelerator ring. The International MegaGauss Science Laboratory is part of the Institute Solid State Physics (ISSP) at the University of Tokyo. As part of a major push to optimize the magnetic fields generated by the laboratories MegaGauss machine it is important to synchronize the trigger events that fire banks of large capacitors. ISSP required a fully synchronous 10 channel digitizer system that delivers a single shot sampling rate in excess of 1 gigasamples per second (GS/s). DESY, short for Deutsches Elektronen-Synchrotron, is based in Hamburg, Germany and operates particle accelerators to investigate the structure of matter. The accelerators run 24/7 for international experimenters so it is vital to have equipment that can be relied on to work perfectly and for many years.